← Time flies when you are having fun… and are hard at work! I solicited questions from Symantec colleagues. What do you want to know (professional and personal, work related or cultural)? So here are a few of your questions. If you have any more for me or the team, let us know. We love hearing from you. Thanks! It has been in the 70s (21* C) all week with a little bit of drizzle yesterday. 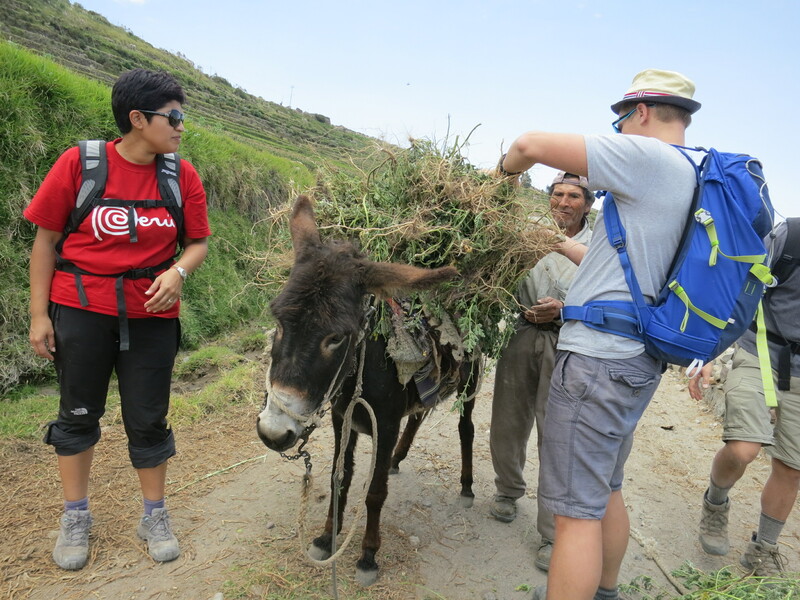 How is your Spanish now that you are in Peru? Mas o menos. Comprendo mas de que yo hablo. Necesito practicar más. How do you communicate? Do you have to speak Spanish, or is English fine? It depends. English during work meetings; each group has an assigned interpreter. Outside of work I try to speak Spanish. 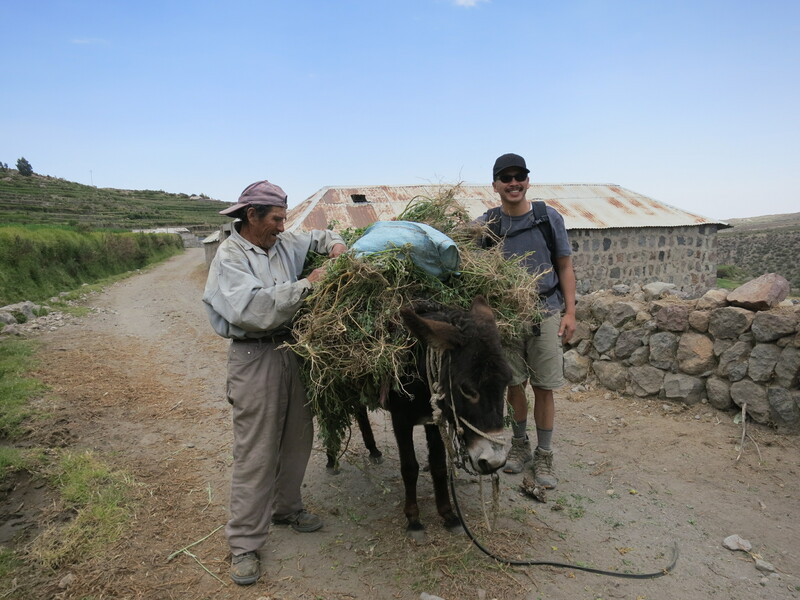 Most locals don’t speak English—so it is helpful to know key phrases. What is your daily routine like? What are some key differences from living here [USA]? Wake up to a delicious buffet. Our taxi comes at 8:30am and drops us back at 5pm. All of the teams get back around 5/6pm. Teams will then debrief further or use the free time to run errands or work out. Around 7:30pm we head to dinner which takes at least two hours. By 10pm most people are heading to bed, skyping with loved ones, or working. 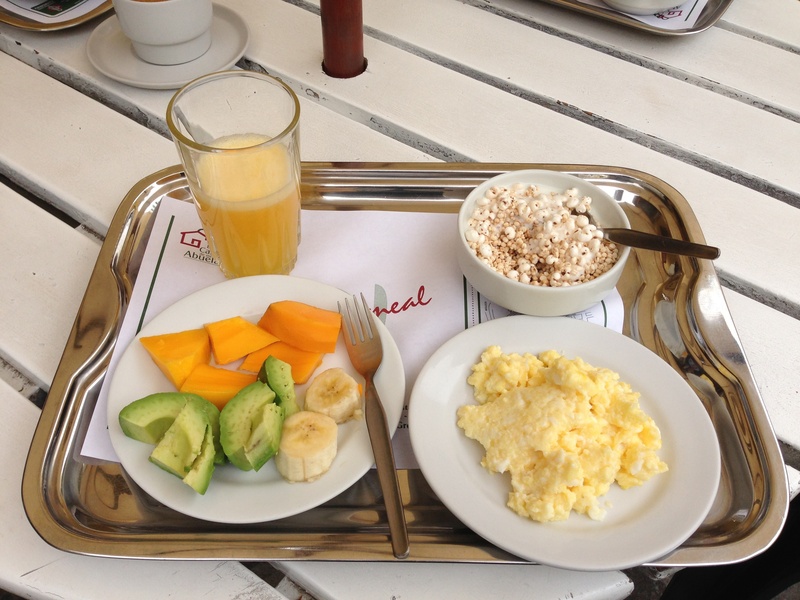 (Left: a sample of my breakfast tray #1 (always room for seconds): orange juice, quinoa w/ yogurt, mangoes, papayas, bananas, avocados, and eggs. 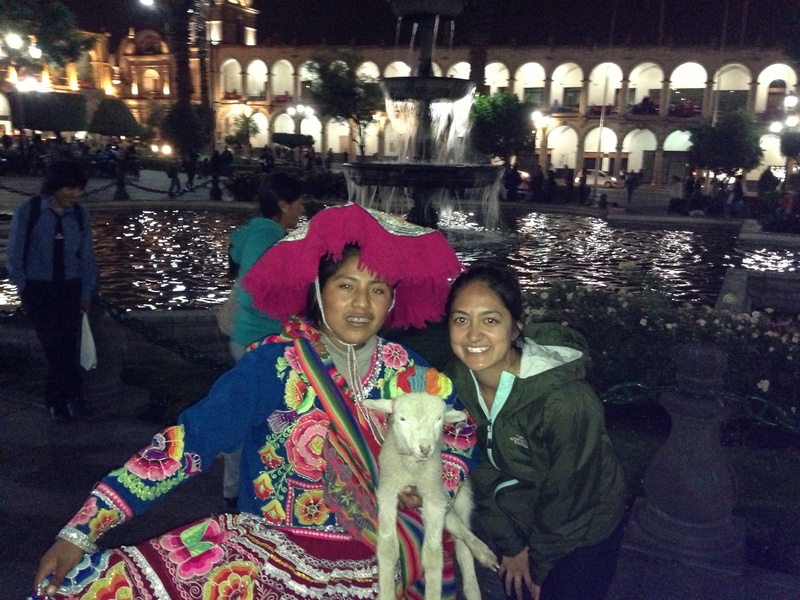 Right: Errand run in the square leads to taking photos with a girl and her lamb, Rosalinda). A few differences: time (Peruvian time is more casual (+/- 15 minutes) versus the ‘Corporate America’ on the hour), traffic (no one pays attention to stop signs—and cars have the right of way), and the flow of water (yes, it is counter-clockwise here). I am learning so much, I don’t know where to begin…I am working with an all male team for the first time. I am learning how to consult in a foreign country. My team has been really supportive and we have open communication, but I do find it challenging to speak up when I’m unsure or don’t want to speak over someone. I am forcing myself to lean in and sit at the table, presenting my ideas and sharing my expertise (HR and OD). By taking the risk and stepping out of my comfort zone, I am growing so much more. Some ideas work and some don’t, but if I don’t take the risk, I don’t glean as much. So far my knowledge has been relevant and helpful—To summarize, I’m working on my confidence as a leader. Have you eaten guinea pig yet? And, on the same note, how’s the food? Favorites? No guinea pig yet. 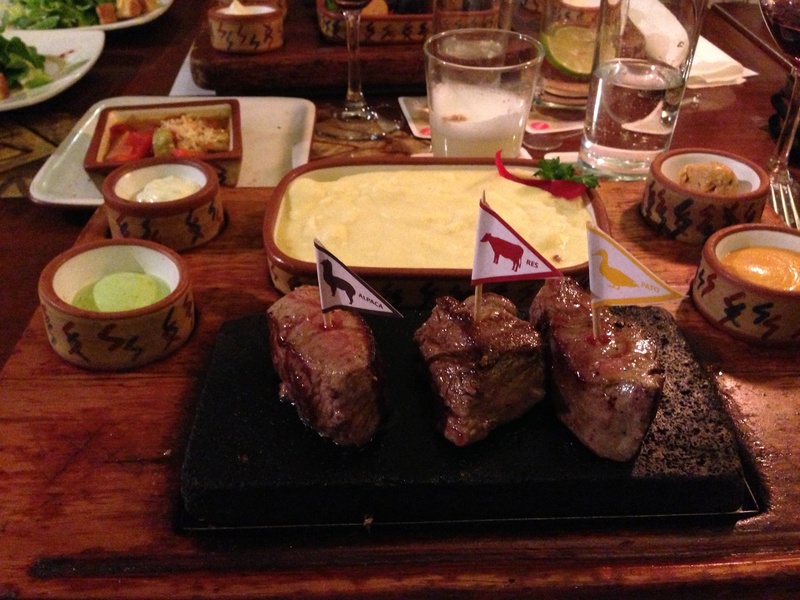 I’m still debating…I have tried Alpaca, Adobo, Rocoto Relleno, and Lomo Saltado (local cuisines). Food is awesome. Huge portions. My favorites are the fruit juices and desserts. (Left: Alpaca, beef, duck, potatoes, and ratatouille. 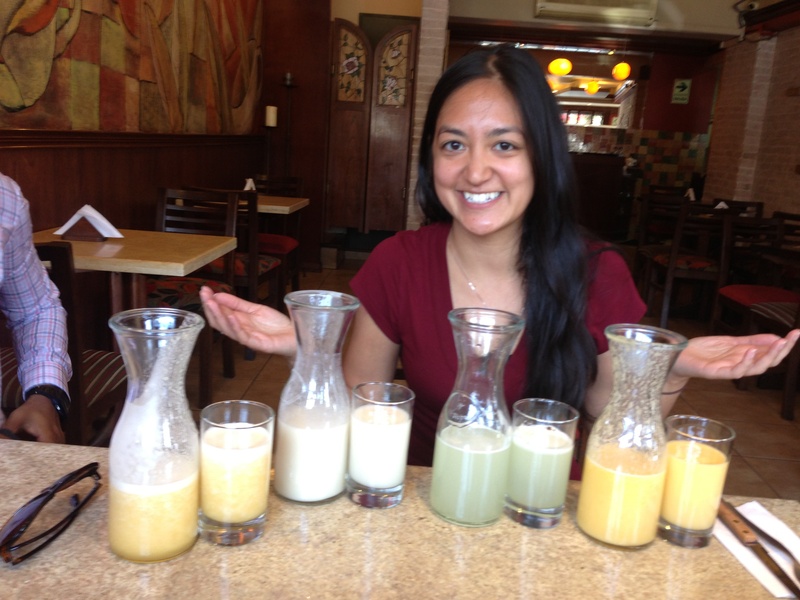 Right: Assortment of fresh juices). What was the one thing that made you most uncomfortable (mentally or physically) and how did you deal with it? Physically: The mosquitoes are eating me alive! I’m now diligently putting on repellent. Mentally: I always feel a little homesick when I go to a new place, but technology helps. I email and video chat with friends and family. Also, we have such a great team—there’s no time to miss home! What is one thing you did that made the most impact on those around you? What’s one of the biggest surprises been? A few nights ago we were all sitting for dinner and Steve Bennett (our CEO) called. I was surprised he knew our local numbers. Someone handed me the phone, and I answered with an ‘hola.’ The restaurant was loud so I proceeded to get up and find a quiet spot when my colleague told me it was a joke. There’s a ‘fake call’ feature on the phones we were given. Who knew? We all had a good laugh. I tried a yoga studio around the block. That was fun (basic Vinyasas with the mix of Spanish and English instruction). I generally go for a walk after work and aspire to run at this altitude. 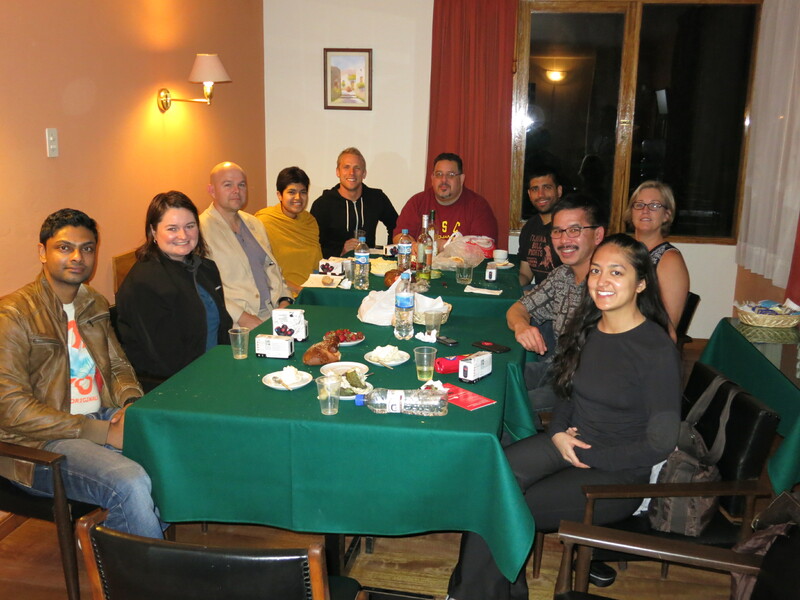 Last Saturday a group of us went on a long hike in Cachamarca. 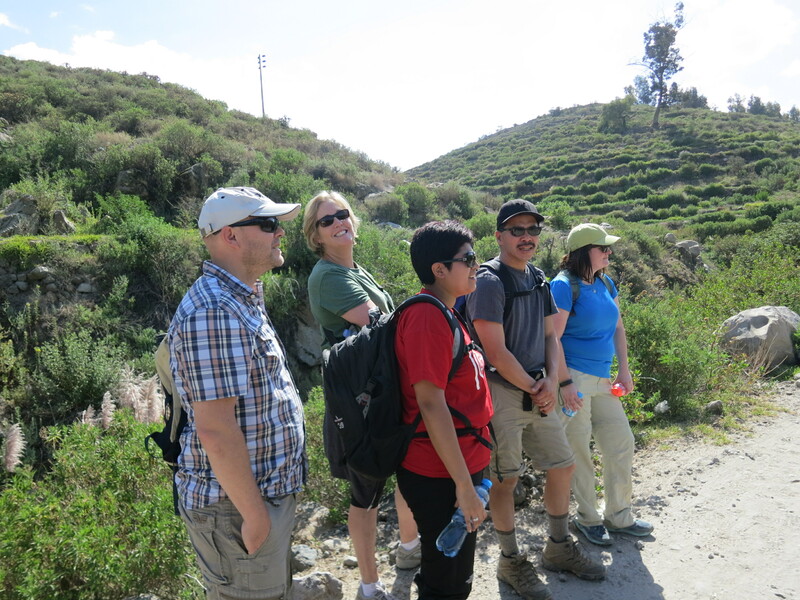 We hiked a total of 8.8KM and climbed 1,000 feet for a peak altitude of 3,200M. Hope you all enjoy converting those numbers (joys of a multi-cultural team). 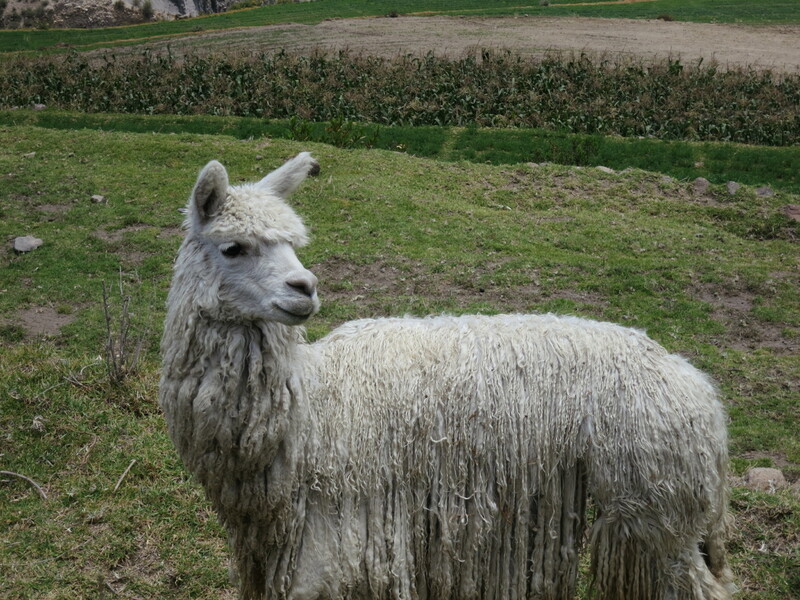 What are the things on your Peru bucket list that you would like to experience before you leave? 3) Continue to step outside of my comfort zone to better myself. Yeah, metric system all the way! Nice one Allyson. Loving the Q&A idea btw.